Eggnog, seems like most people either love it or hate it. 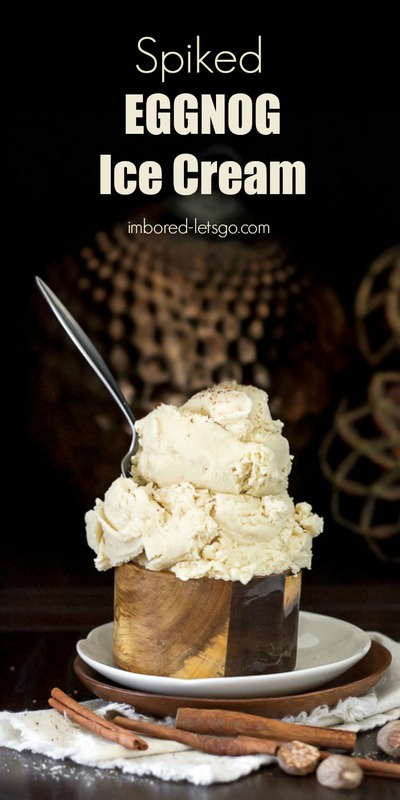 I happen to reside in the love it camp…love it in martinis and desserts like bundt cake and this Spiked Eggnog Ice Cream. Oh, who am I fooling? I’d probably happily drink it at a holiday party as well. And, I’ve been know to use it as a coffee creamer too! Since this has been the year of frozen treats for me, I just couldn’t pass up the opportunity to make some spiked eggnog ice cream this month. 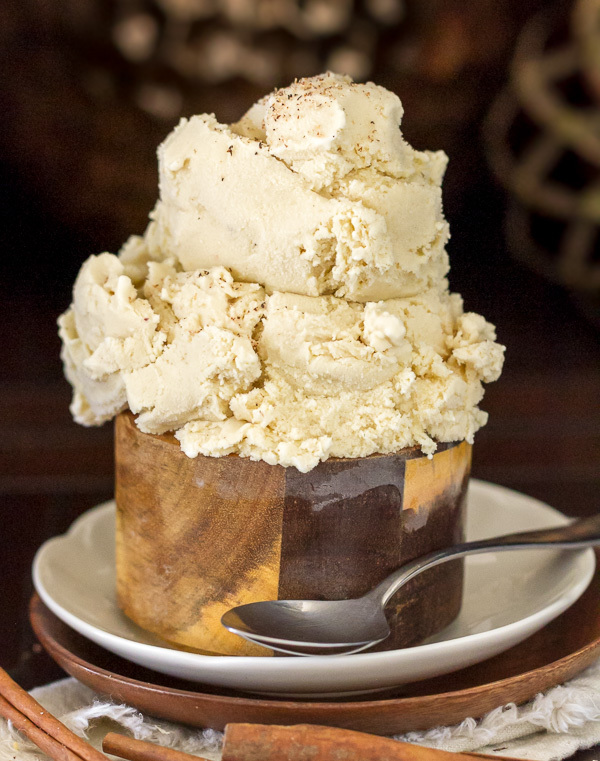 So I had a decision to make… should I spike my eggnog ice cream with brandy or rum? Both choices sounded tasty to me so I used both! And it was delicious. I wanted to keep this recipe super simple since I’m sure everyone is spending enough time in the kitchen already with holiday baking, right? So this is not a custard based recipe – I didn’t think it was necessary to add any additional eggs since the eggnog had eggs in it already. I did add a little brown sugar, thought that would play nice with the brandy and dark rum, and also added some freshly grated nutmeg. 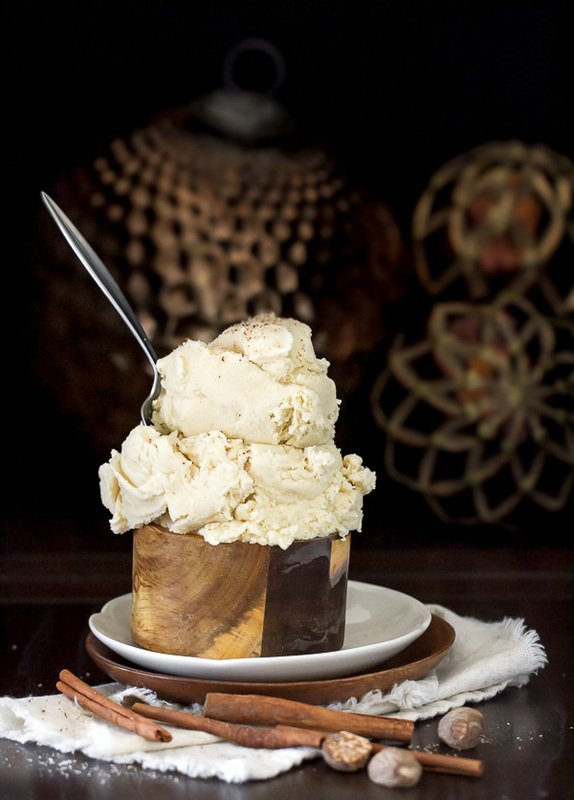 Freeze canister of your ice cream maker the day before making this ice cream. Add all the ingredients to a bowl and whisk to combine and dissolved the sugar. Pour mixture into ice cream maker and process according to your ice cream maker's instructions. For me, it's about 15-20 minutes. Pour ice cream into container and freeze until firm. What a treat! I love this (since I eat ice cream all year)! Perfect for the holiday season (over pumpkin pie, too?? ), and I love the wooden bowls you serve it in – nice! Ooh my goodness this looks gorgeous. I haven’t had eggnog for years, but I do like it, so can imagine how good it would be in frozen form. You had me at ‘spiked’ and ‘ice-cream!’ This looks gorgeous,very festive, perfect for the vegetarian Christmas dinner we are hosting at our place this year. Well, I’m in your camp — I love egg nog any way I can get it. The rest of my family think it’s “beh”. I could drink a gallon of it and if you spike it?? This person will be a very happy camper!! Thank’s for sharing your recipe. YUM!! sounds perfect for rhe ny eve dinner I have in mind: an elegant and adult dessert! such a great idea – I bet this would make a great extra dessert after Christmas day lunch! Apart from the fact that i want to bury my face in this ice cream, I also think it is a fantastic shot. Okay, this right here is what i want to be snacking on right by the fire place. Well done ! OK….. YUMMMMM! Merry Christmas to you n Mark! This looks amazing! So simple to make, I’m totally doing this for the weekend!